Irish Portrait Painter, Landscape Artist. Biography and Paintings. The Irish portraitist, landscape and figure painter Dermod O'Brien was born in County Limerick in 1865, a grandson of the Irish patriot William Smith O'Brien. He attended Harrow School and Cambridge University, before visiting the Continent in 1886 to study the paintings of the Old Masters in the Louvre Museum in Paris. The following year he was in Italy and determined upon a career as an artist. Later in 1887, like Richard Moynan, Roderic O'Conor and Norman Garstin, he enrolled at the Antwerp Academy to study under Charles Verlat. Walter Osborne was a fellow student. In Antwerp, O'Brien won a silver medal for drawing. In 1891, Dermod O'Brien attended the Academie Julian in Paris where he befriended the artist William Rothenstein. By 1894, Dermod O'Brien was at the Slade School of Fine Art in London, sharing a flat with Henry Tonks, and exhibiting at the Royal Hibernian Academy (RHA) in Dublin. He also showed at the Royal Academy (RA). 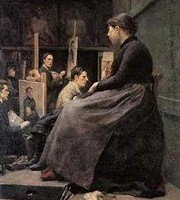 By 1901, Dermod O'Brien was back in Dublin painting portraits. Upon Walter Osborne's sudden and untimely death from pneumonia in 1903, O'Brien was jockeying with Sarah Purser to succeed him as the top portraitist. In 1905, he was elected an associate member of the RHA, and in 1907 a full member. Three years later he was elected President - a post he held until his death. In 1912, he was made an honorary member of the Royal Academy in London. He began teaching at the RHA art school and exhibited regularly at the RHA for 35 years. His artworks were also shown at a number of other exhibitions, at Leinster Hall Dublin, the Royal Scottish Academy (RSA), the Royal Society of British Artists, and Mills Hall Dublin. During the period 1910-1938, he was heavily involved in the administration and organisation of Irish art affairs. The auction record for a work by Dermod O'Brien was set in 2003, when his oil painting entitled Heading the Stocks was sold at DeVeres, in Dublin, for €28,000. Dermod O'Brien's paintings and portraits are represented in many important Irish public collections.  For details of other Limerick painters and sculptors from , see: Irish Artists: Paintings and Biographies.  For more about traditional artists like Dermod O'Brien, see: Irish Art Guide.